There are plenty of restaurants in San Miguel de Allende where you can get lunch for under $200 peosos/$10.00 USD but which restaurants use the best ingredients? For the next 30 days, we're here to let you know because we think high quality ingredients define great food. 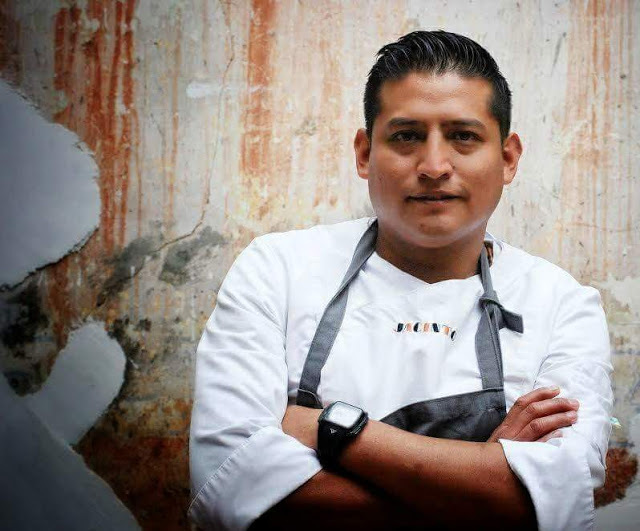 How fantastic is Jacinto 1930, one of SMA's best Mexican restaurants, thanks to award winning chef Israel Loyola Espinosa who uses only the best ingredients in his dishes. 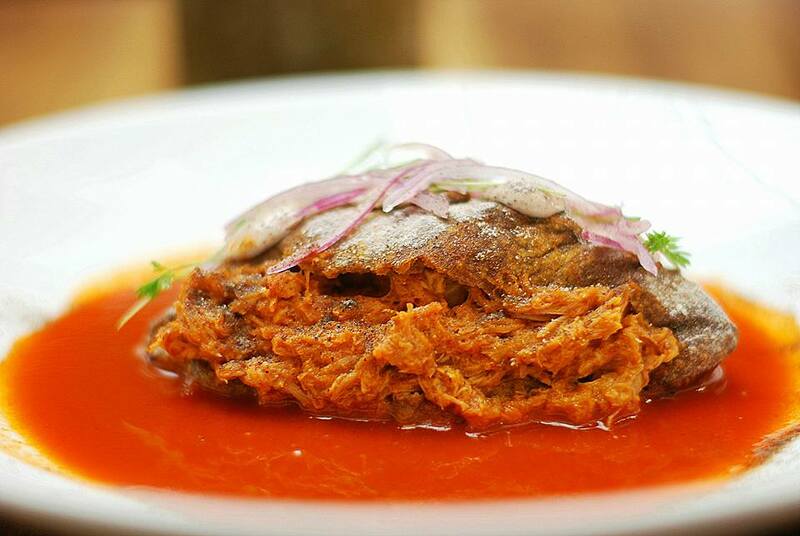 Our favorite is the Cochinita Pibil Ahogada Sandwich with pickled onion and habanero chili in a bean bolillo with avocado leaf and bean mayonnaise. 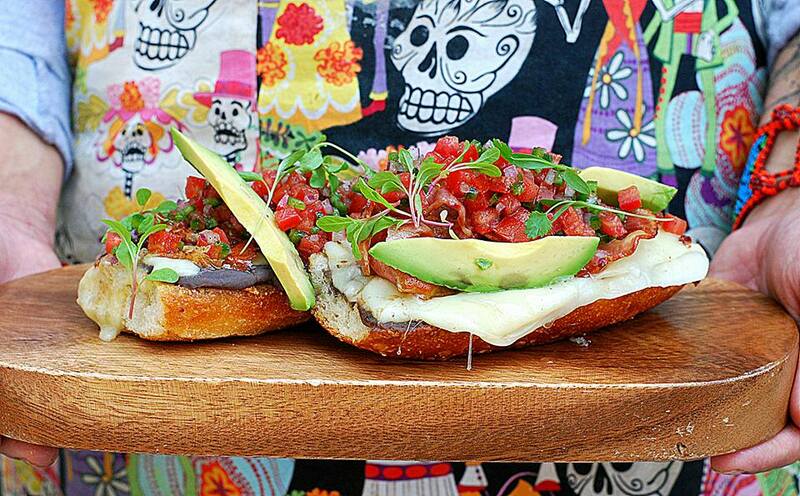 This signature sandwich of Guadalajara had delicious flavors and could easily become a weekly habit. I'm just happy that I don't have to go all the way to Guadalajara just to get one. $140 pesos. Surprised at the price? We were too, with many items on Jacinto's menu that are under $200 pesos. Doce 18 at Relox 18. Open Weekdays: 1:00 - 9:00 PM, Monday - Thursday. 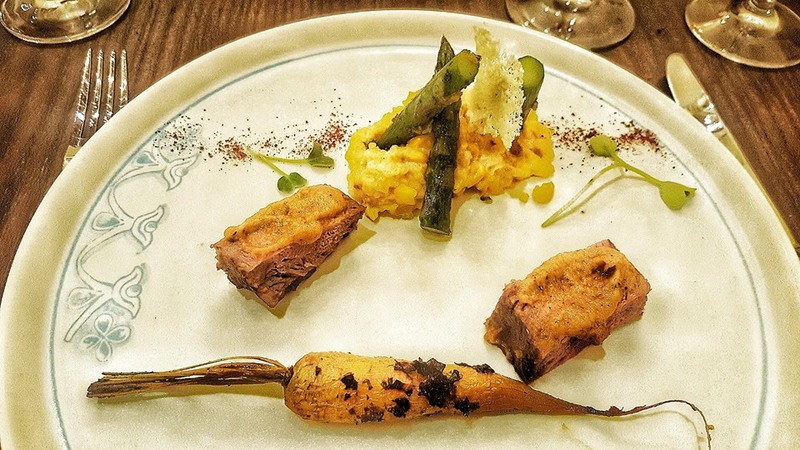 Chef Xavier Piñero Moreno, the new chef at OCRE WOWED with a perfect balance of flavors. 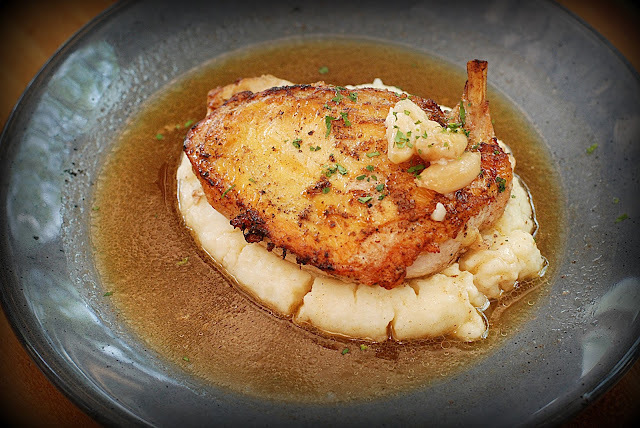 OCRE selects the freshest ingredients, adding layers of flavor and texture to every bite. What was in this salad that made it so amazing? 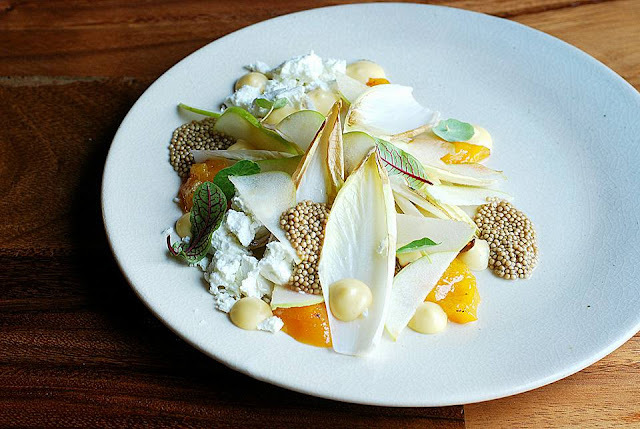 Nothing you would find in a normal salad: Charred endives, apple, caramelized peach, mustard seeds, goat cheese, nasturtium, and peach dressing. Beautiful? Yes, and it tastes as good as it looks. $120 pesos. If you crave good meat, order the Rib eye taco: a handmade corn tortilla, chimichurri mayonaise, rib eye, and thin, sliced potatoes. $90 pesos each. OCRE's young chef team, Chef Xavier Piñero Moreno, Sous Chef Danny Duran and Pastry Chef Fernando Arias Ruiz are going to be the trio to beat this year. High quality ingredients are just part of the story. Everything at OCRE is just a step above the rest. So what do you do when you want to find out what the other end of town is up to? You go to La Parada, where at least half of SMA is having lunch. It's 3:00 PM on Thursday and it's packed. La Parada has consistently been in the top restaurants in SMA since they opened their doors. Chef Alexandra Gutt has been buying her produce from the same guy for years; he knows her quality standards and what she expects. Her seafood is sourced from Mexico's coast and is always really fresh. Lunch today was a fabulous Shrimp Sandwich. The chef warned me it was big; so big in fact, they served it in a bowl. It tasted exactly like the shrimp poorboys you get in New Orleans. I ate the entire thing. 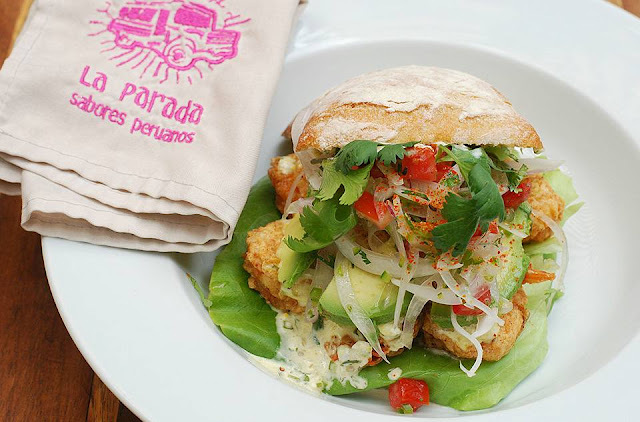 On a very soft Ciabatta was fried shrimp, and lots of it, piled high with lettuce, pickled onions, tomatoes, avocado and a tartar sauce. $150 pesos. The surprise announcement: Alexandra and her husband, Juan Leon de Vivero, parterned with Julio Hernandez to open San Mezcal, a welcoming little Mezcal bar just three doors down from La Prada. They have 73 different Mezcals and are working on getting 120 in their inventory. Alexandra and Juan Leon have so many projects going on, all on the La Prada side of town. Expect a lot more from these two; there are other plans in the works for 2018. 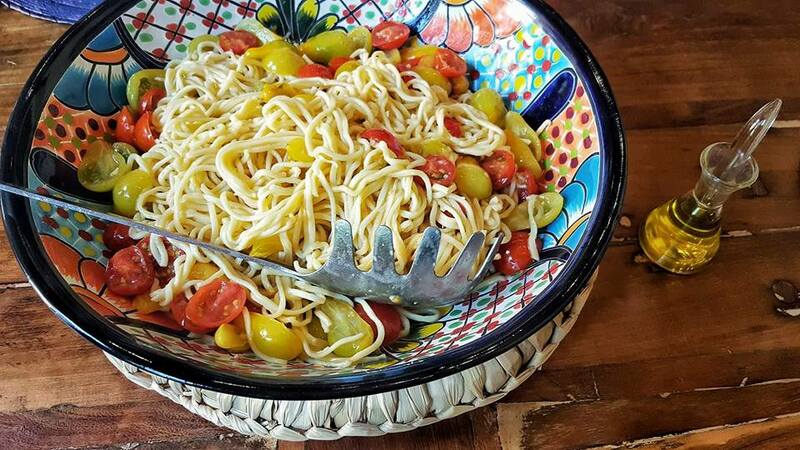 A US food writer recently came to SMA and claimed he couldn't find any good food. Well, he obviously never ate at Nomada Cocina de Interpretacion. 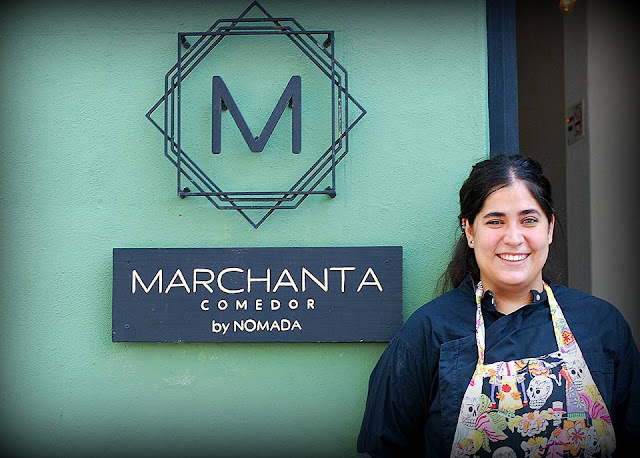 At Nomada Cocina de Interpretacion, good ingredients are a given. 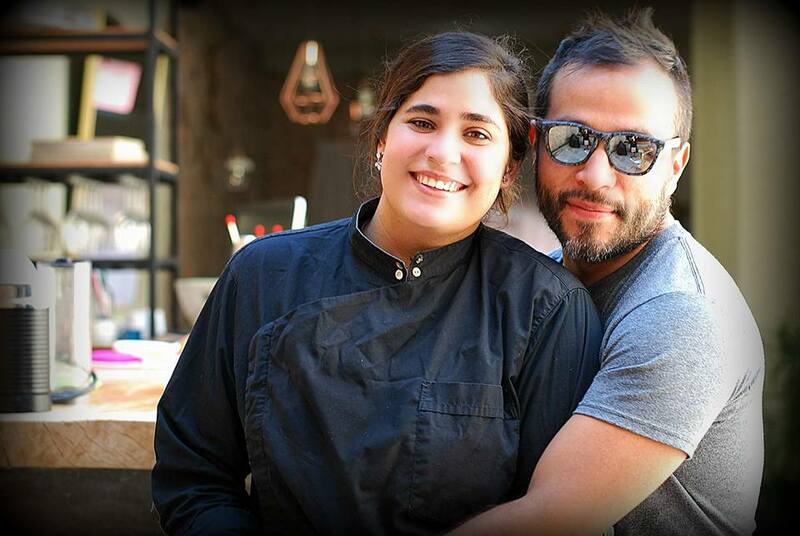 Chefs Marco Cruz and Sofía Antillón think time spent on sourcing good ingredients is time well spent; one of the many reasons their food tastes so great. Chef Marco Cruz is an artist, and like every artist, his visuals demand perfection, down to the final, fresh ingredient on the plate. I love his Wednesday Tasting Menu and the Sunday brunch, where everything is cooked on a wood fired grill. Another one of my addictions is their breakfast; it's one of the best kept secrets in SMA. How many people know they make breakfast, much less one that's as good as every other meal they serve? 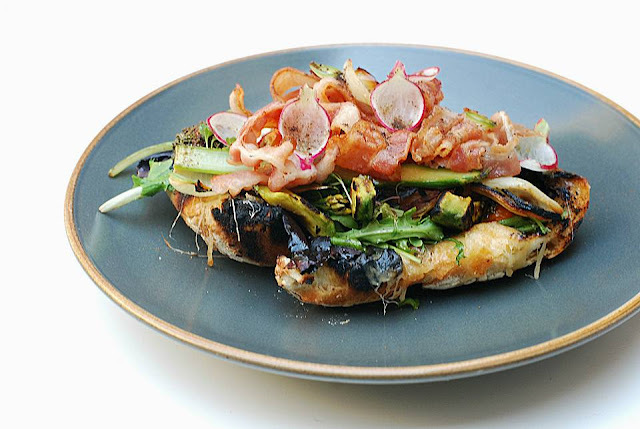 This morning, I had the BLTA sandwich: their famous bread with Gouda cheese topped with Arugula, Baby Lettuce, roasted Tomatoes, roasted Avocado, grilled Onion, Asparagus on the grill, Radishes and Bacon. 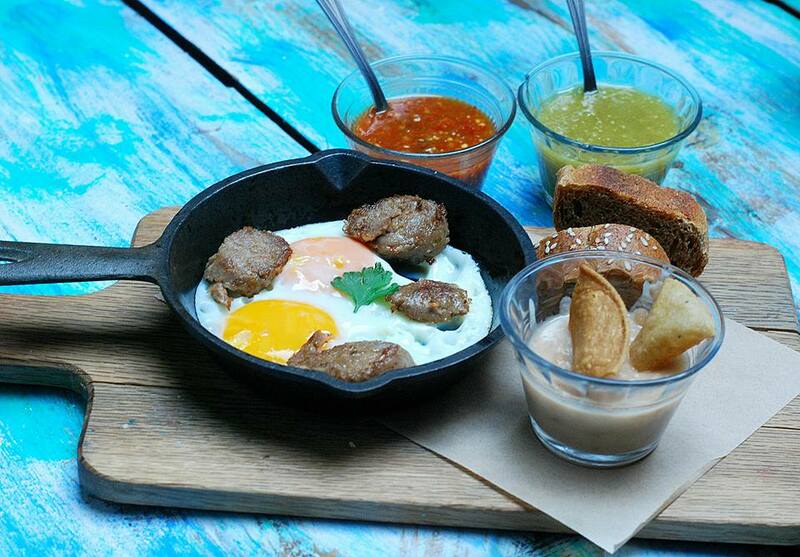 So how is it possible that one of the best breakfasts in SMA is only $90 pesos? 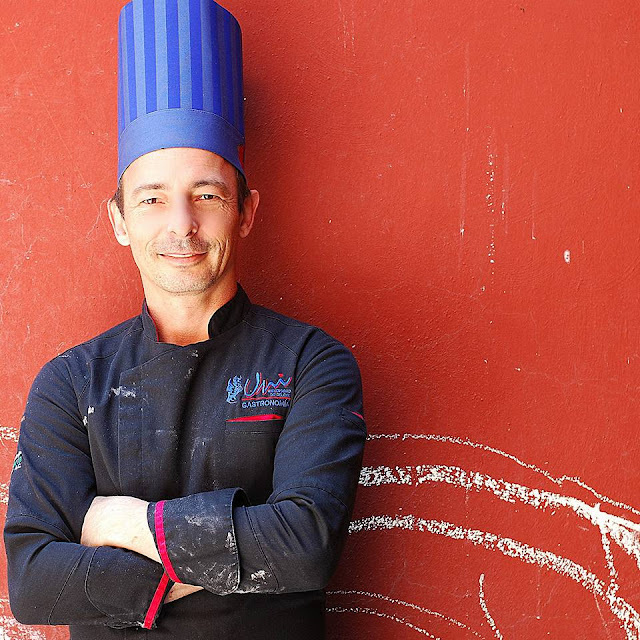 Chef Pablo Nicacio knows all about good ingredients; he was trained by the best. Ask him to find the most beautiful microgreens in SMA and he will always point you in the right direction. He knows quality food. 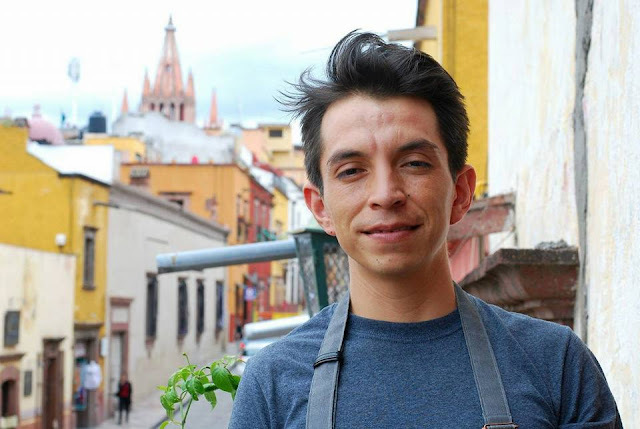 Chef Hugo Tepichin said that a network of friends supply the restaurants with high quality ingredients from all over Mexico, especially Oaxaca. Take Pablo's new breakfast dish: Huevo con Trufa. They cook the potatoes at two different temperatures; it tastes somewhere between smashed potatoes and hash browns. 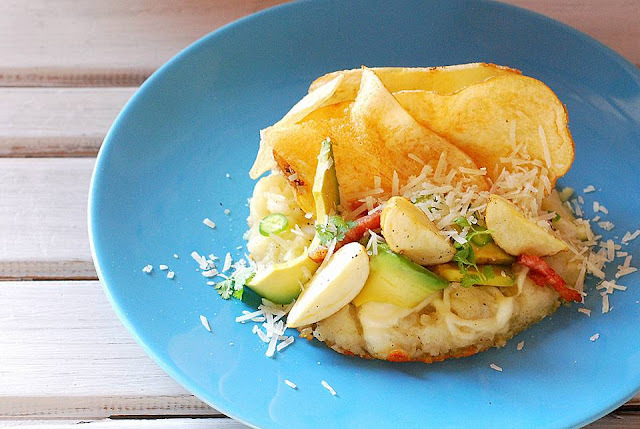 Cook an egg on top with bacon, Oaxaca cheese, avocado, parmesan cheese and jalapeño and garnish with a few, crispy potato chips and truffle oil and you have one perfect breakfast. $115 pesos. No one in SMA has been more passionate about using good ingredients than Chef Donnie Masterton, who cultivated relationships with farmers and food artisans from the very beginning. He's currently in the process of building an organic farm to supply all of his restaurants and has a rooftop garden at The Restaurant to fill the gap. The Restaurant, a SMA tradition for over 10 years, will close for the month of May to do some remodeling. We can't wait to see the new look when it reopens in June. 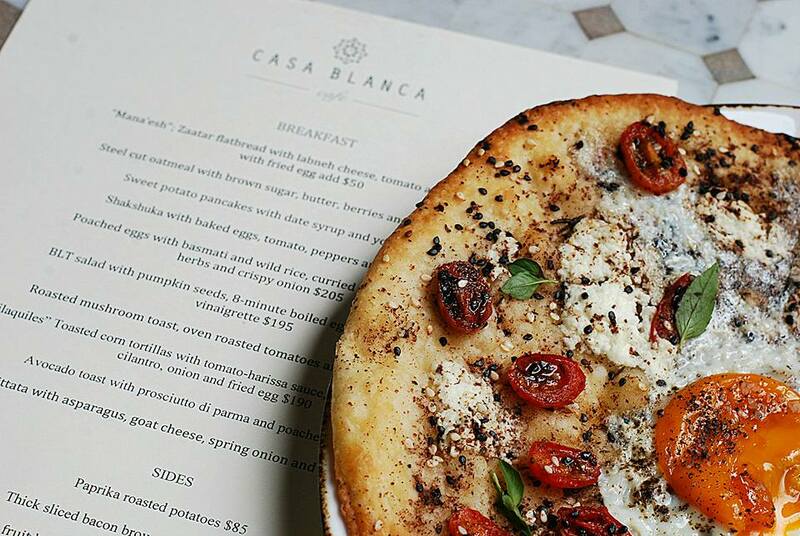 Bringing a new style of food to SMA is exciting and his latest restaurant to open is Cafe Casa Blanca in Hotel Casa Blanca 7. Fatima 7 will also open this summer, promising the same Mediterranean flavors and some amazing views of SMA's historic churches. Today, I was lucky enough to score some of the best breakfast food I've had: a Mediterranean 'pizza': Mana'esh; Zaatar flatbread with labneh cheese, tomato and mint with fried egg. $200 pesos. Labneh is made by straining yogurt past the point of Greek yogurt; the texture is between mascarpone and fresh chevre. It was excellent on this flatbread, which was amazingly light, so I can't imagine how it will be with a simple drizzle of extra virgin olive oil, a loaf of crusty bread and a glass of vino blanco. Yes, this 'yogurt cheese' is perfect for summer paired with a cold Mexican chardonnay. 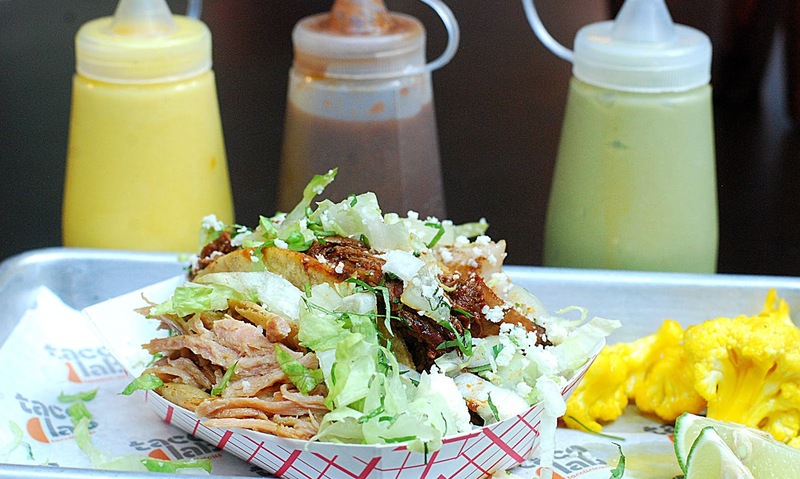 Chef JJ Castaneda's cooking is unique; SMA has no other flavors quite like his. 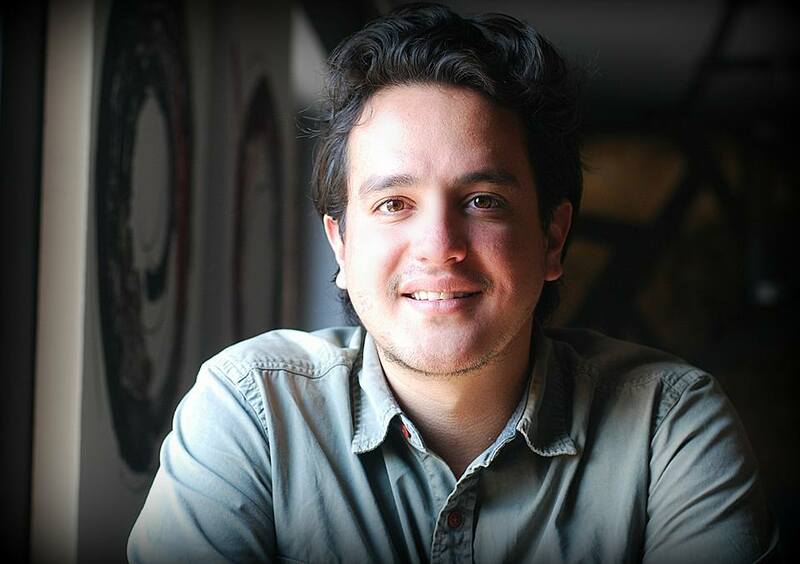 One of our favorite waiters, Gabriel Vazquez, is also at Cafe Casa Blanca. Don't forget to ask for him; you're guaranteed to get VIP service. It's Tuesday and the restaurants are closed but I'm in class today where I'm reminded about sourcing good ingredients every time I come here to cook. Chef David Jahnke teaches at the University of Celaya, where he heads the department and also teaches a professional cooking course in SMA, where I am lucky enough to be a student. Ask him where he sources most of his ingredients for his classes and he will tell you La Comer. Students laugh but he says that, because of their size, La Comer has resources other vendors don't. La Comer also owns City Market in Queretaro. How does he do it? Well, he's managed to develop a personal relationship with everyone in the store including the butchers and the guys in produce department. 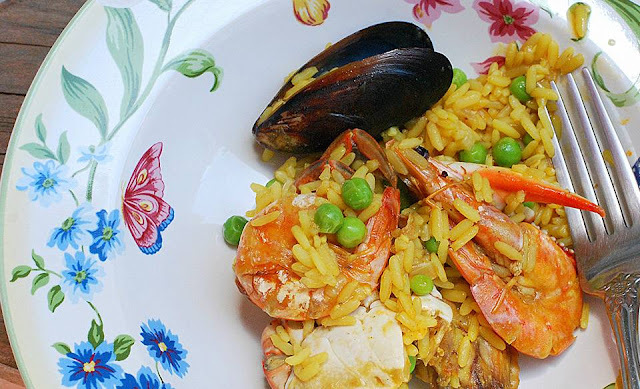 He asks for specific things and they get it or order it for him, like all of the seafood and meat that went into this Paella Valencia and the ingredients for this oxtail stew. And did I tell you that the best part of every class is the eating? Both dishes were off-the-chart delicious. I'm a breakfast person. Give me a choice of breakfast, lunch or dinner and I will always pick breakfast. Maria Guadalupe Ramirez Soria (Lupita) is the chef at Café Oso Azul and she prepares a breakfast that only a hungry gringa could get on an early morning when everything else is closed. She uses good ingredients; you can tell by the taste of the food. The flavor of this sausage was delicious; I could have easily eaten another helping or two. It's made by a local vendor; local always being better because you know exactly what you're getting. What I love about this cafe is that everything is made fresh, down to the jams and salsas. They always manage to make you feel like you're eating at home with your family. 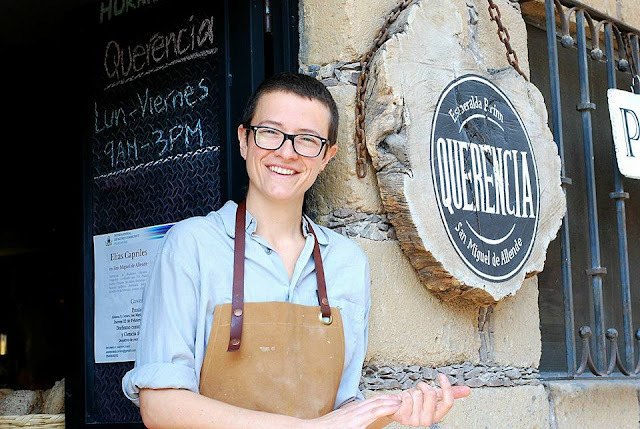 In our recent post on the Best Food and Drink in San Miguel de Allende, Querencia was our pick for the best hidden gem restaurant; they get plenty of support from their Colonia Guadalupe neighborhood but would you go out of the way to eat there? Well, we have, six times now, and we'll go back again next week. Why? Good ingredients = Good food, it's as simple as that. With everything priced under $100 pesos, it's also affordable. 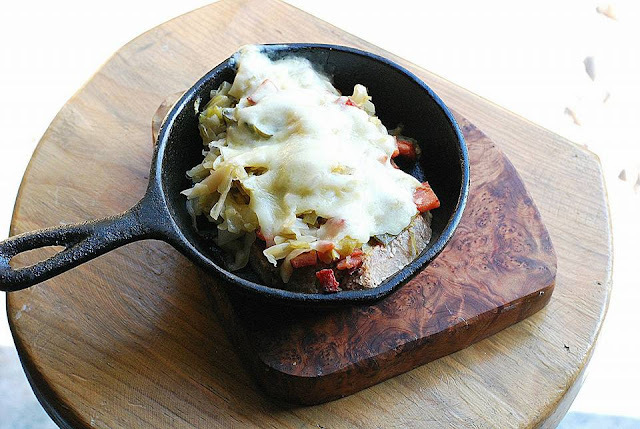 Our favorite dishes are the Eggs Benedict Querencia and the Sauerkraut Sandwich. 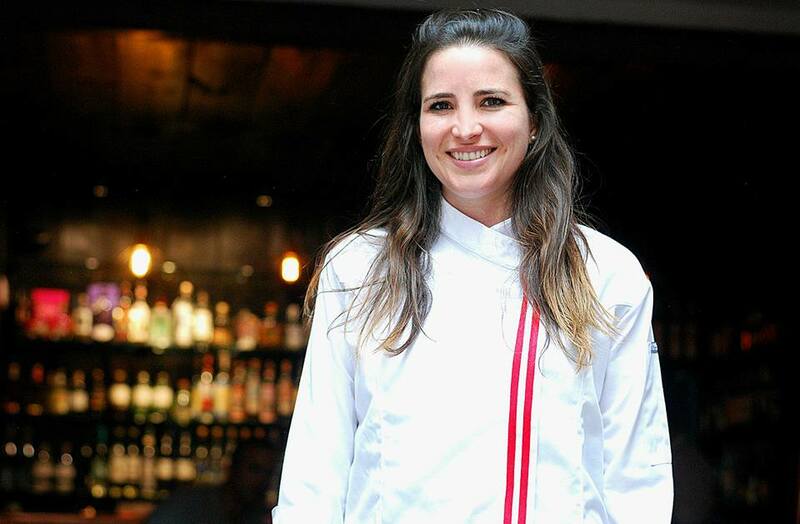 Chef Esmeralda Brinn Bolanos recently gave us her philosophy on sourcing. We like a restaurant that's selective about the products they use but also has a higher purpose than their own for buying from local vendors...be it a single mother or a small, local supermarket. "In Querencia we source our ingredients from the most proximal provider possible. For instance, our goat cheese comes from Senor Francisco, who has his goats at home and makes from 1 to 10 pieces a week. Everything is seasonal and some ingredients change according to that. 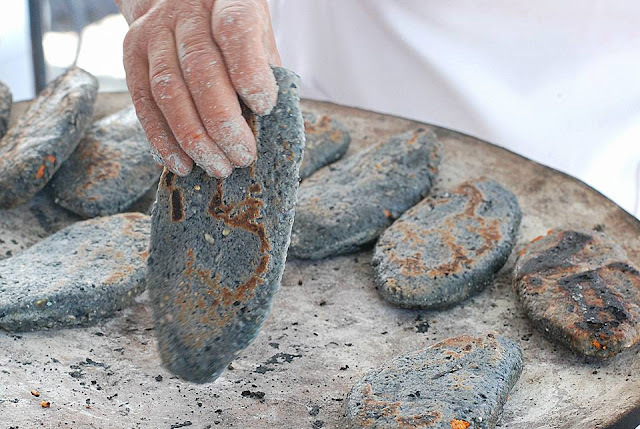 Our blue tortillas are hand made by a woman who has her own milpa at her ranch; she comes to sell them once a week. 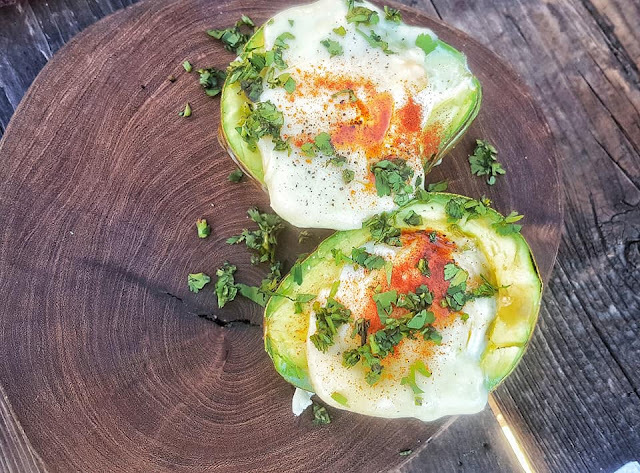 Our eggs come from a friend, who is a single mom of two and brings them from an organic ranch in Michoacan. The most commercialized ingredients that are brought from Celaya, we get from our local small supermarket, Don Gil. The goal with our ingredients is that they must be local, or from small producers or with a story behind that gets to our hearts and has a bigger benefit than our own. Like our mezcal, that comes from Oaxaca; it was sourced visiting lots of producers until we met one that matched the quality, ethical and spiritual standards that we set." One of our favorite restaurants in SMA, we not only love the food but also adore the owners. Good ingredients? Well, that's a given from this chef, who was a popular contestant on Top Chef Mexico and has managed to delight all of her customers at Marsala, cocina con acentos as well. 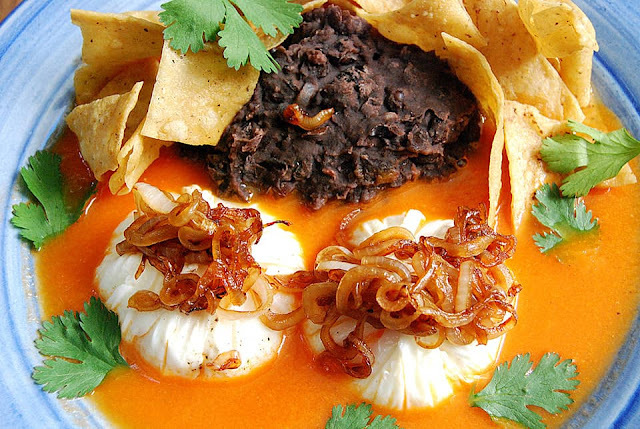 Marcela Bolaño's food speaks for itself. She doesn't have a long list of suppliers but the ones she does use are top quality: Fish, seafood and russet potatoes all come from top quality suppliers in Ensenada, Lamb from a private ranch in Guanajuato, meats from XO Centro, part of the Visa del Norte Group, headquartered in Chihuahua, Norma for microgreens and Pascual and his son Leonardo of Fruteria la Huerta de Lupita on Sterling Dickinson, who work with her daily to source her produce. 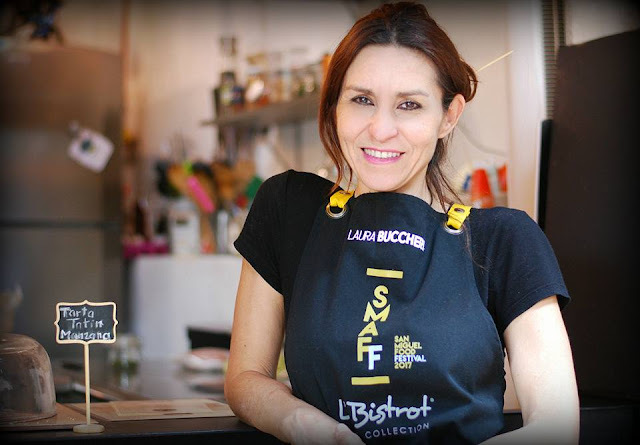 You can thank Marcella that Fruteria la Huerta de Lupita now carries limón amarillo. She said for Oaxaca cheese, Pascual's is the best in town. Don't forget Marsala's for brunch on Sunday; one of the best in SMA including a wake-up mimosa. The best pastry chef in SMA is getting her own bakery and we say it's about time! Marchanta is undergoing a bakery white face lift combined with an eat-in/take-out restaurant focusing on casual dining. 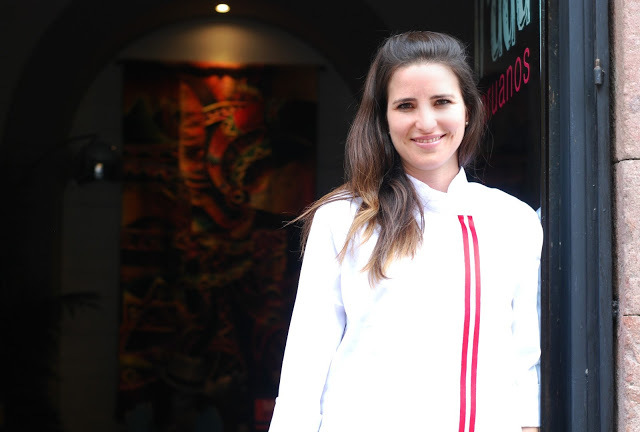 Sofía Antillón's glass pastry case at the back of the restaurant will be filled with just baked breads, cookies, cakes, rolls and other pastries. A simple breakfast, sandwich and salad menu will feature foods made with the best organic products including the delicious Molletes I had this morning served with a spicy but fabulous habanero peanut sauce. $110 pesos. The menu includes juices; just like the ones we got during our detox. The juices are super healthy - they're made with all fruit and have no added sugar - and have wonderful flavors that only a chef can dream up to fill a glass. $50 pesos. This one is the delicious Amarillo made with orange, pineapple, mango, passion fruit, and turmeric; you have a choice of four different blends. Marchanta makes Licuados using almond milk, rice milk, coconut milk and wheat yogurt. $70 pesos. With more homemade Aguas and other bebidas, Nomada will offer a variety of drinks including beers, wines, Chai and coffees. Both Marchanta and its sister restaurant, Nomada cocina de interpretacion, use only the best organic ingredients. They have used a private vendor for the past year and a half to source vegetables, greens and other items. In the back of Marchanta, a new deli market will feature high end cheeses, creams, Noble vinegars, Cecina, marmalades, bakery, cakes and brownies to go and other take-out items including organic vegetables, seeds and nuts. It is Sofia's intent to make as much as possible in-house. Even their son, Leon, has his own space, selling candies, gourmet chips and other edibles for little and grown up kids. There will also be a section in the store that will feature plants and beautiful table fabrics. Connect with both Marchanta and Nomada on Facebook for upcoming information on the 2nd anniversary of Nomada and for the grand opening of Marchanta's new bakery. Both will happen in late May; dates have yet to be set. Menu served: 8 AM - 3 PM daily except closed on Sunday. 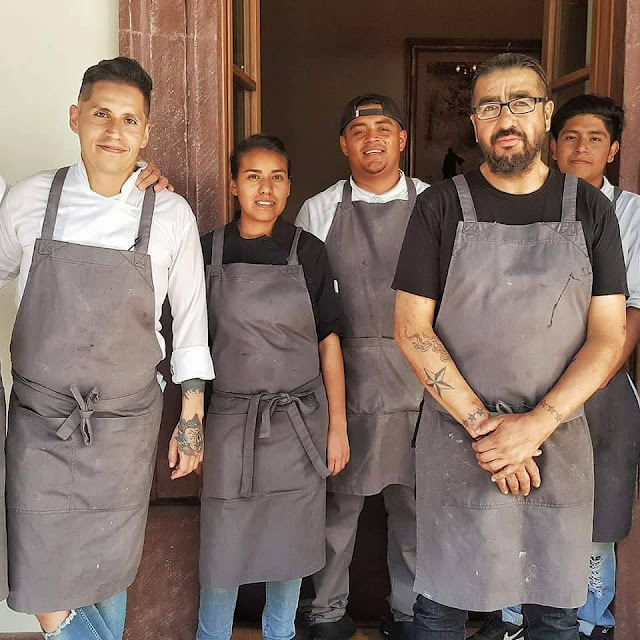 If one restaurant in SMA is all about great food, comfort food at that, it's Nuova Spaghetteria La Cucina di Afrodita, Chef Laura Buccheri's second restaurant in San Miguel de Allende. Like its sister restaurant, Trattoria da Laura a Los Mezquites by La Cucina di Afrodita, in the countryside outside of SMA, this little spaghetteria, located in Centro at Mercado del Carmen, uses the best ingredients available, many of them handmade by Chef Buccheri and her husband Justin Mareno. 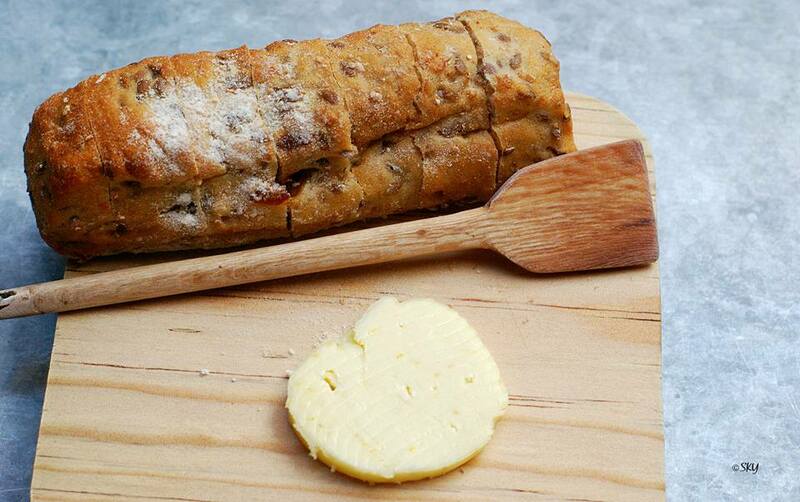 Cheeses, breads, ice creams, pastries, sausages, jams; they're all made in-house. They even make their own Limoncello. 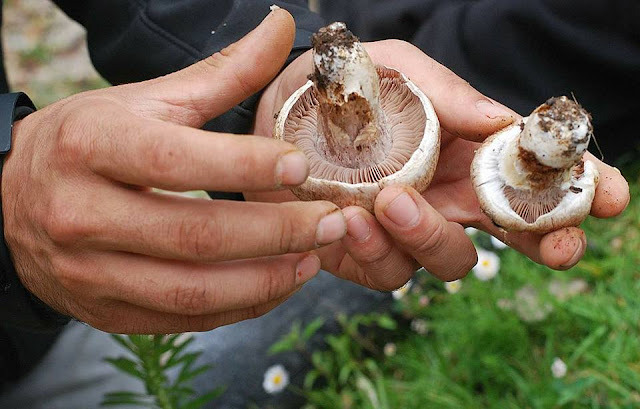 In addition to growing many of their own vegetables, La Cucina di Afrodita sources produce from Bodega Organica at Rancho Luna Escondida and also hand picks ingredients from a small grocery store in Comonfort. It's important to know where your food comes from. At the Mercado Rural, the first Sunday of every month, you can depend on good food direct from the producers; food free of chemicals and pesticides. The market, one of the most authentic in SMA, was created to support the producers of the communities surrounding San Miguel de Allende. These quality vendors bring SMA some of the best handmade products; clean products with fair trade pricing. If you want to connect with your food and get a dose of real Mexico, we'll see you at Mercado Rural. Don't forget to bring your camera; this group of super friendly vendors loves to have their picture taken. It's not exactly a restaurant but it should be; so much great food comes out of their kitchens. The one thing I discovered recently: I LOVE anchovies, but only the ones from Italy. I've decided to adopt this group, claiming all of them as familia; all of us getting an advanced sampling of the pizza that Fulvio Carbonaro will make in a pizza class for chefs in SMA May 15th and May 22nd. Gilda Carbonaro runs Culinarian Expeditions, a culinary touring company that takes small groups to Italy and Mexico and also teaches cooking classes in her homes in Italy and SMA. Gilda told me recently that she sources all of her food locally. "We get Ciro or Mutti tomatoes either at Bonanza or Mega. We get the flour from Bonanza and sometimes a friend brings us a bag of excellent flour from Mexico City (I don’t know the brand); Caputo flour is just too expensive to import. Mozzarella is Remos’s at Mega. We get the anchovies here too at Bonanza or Mega; I often just bring little jars of them back from Italy, because they’re so much better. Capers and olives are from Bonanza. 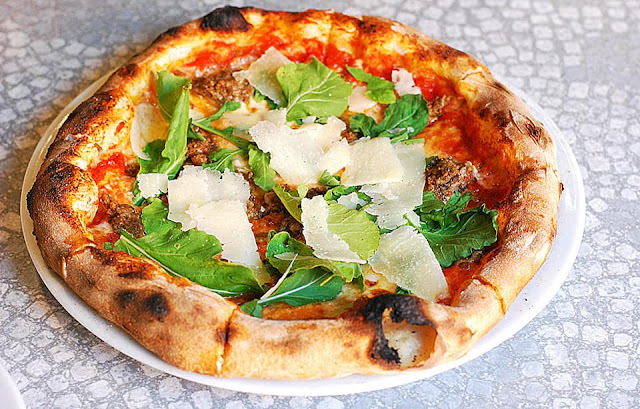 The fresh ingredients come from Mercado Sano, like pomodorini, arugula, onions, zucchini. 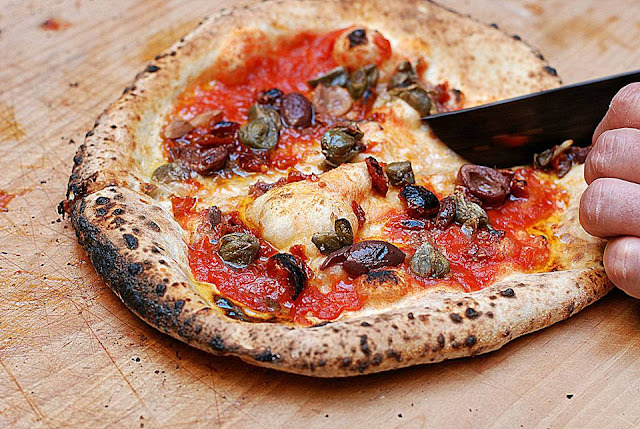 The herbs like oregano, rosemary and basil are from my rooftop." If you want to get fed really well while you're in SMA, this is the place to start by signing up for a cooking lesson. Belmond Casa Sierra Nevada recently got a facelift and she's a beauty; elegance, fused with a touch of home. The gorgeous paintings on the walls in the dining room were made by artist in-house, Jose Luis Arias, taking up four aspects of Otomi culture.The first one includes the four elements of the earth, represented by four seeds in the tree of life. The second wall has a mural dedicated to the continuity of life, represented by a spiral and evokes a belief that rituals guarantee the continuity of life. Another wall has corn as an essential element of the Otomí culture and Mezcal, an element dedicated to the festivities. In all of the walls appear birds, animals and plants that represent the culture itself. They are all white and stenciled; difficult to get a photograph that shows their true beauty. Go there to see them yourself. 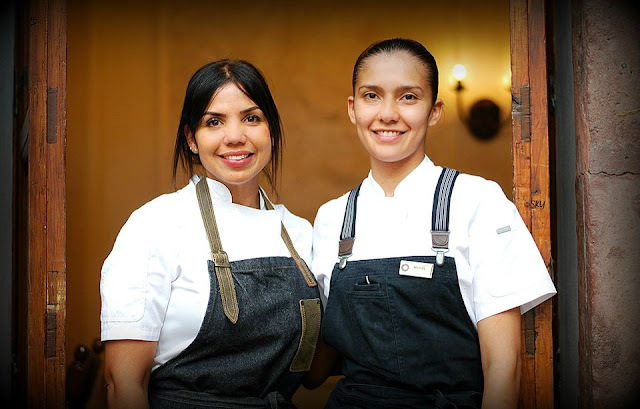 Belmond Casa Sierra Nevada's restaurant Andanza opened Monday and to mark the occasion three chefs - Mariel Beiza, Inez Paez (Chef Tita) and Aaron Mizrahi - cooked a feast fit for any food lover with some of SMA chefs in attendance. The new chef at Belmond Casa Sierra Nevada is Mariel Beiza. She previously cooked in Riviera Maya with Chef Alan Carias, the chef at Trazo 1810. She is the first female to head up a kitchen at a Belmond hotel; kudos to GM, John Freudenthaler, for bringing her to SMA. 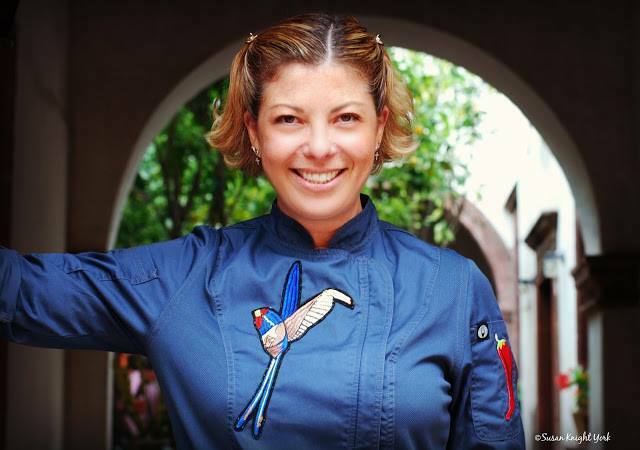 Chef Inez Paez (Chef Tita) is the Ambassador of new Dominican Cuisine to the world; she owns the restaurant Travesías in Santo Domingo. Chef/Grillmaster Aaron Mizrahi is from Mexico City, is an expert on beef and the Ambassador Chef for Creekstone Farms. All of the food for the Belmond Casa Sierra Nevada's restaurants is locally sourced. 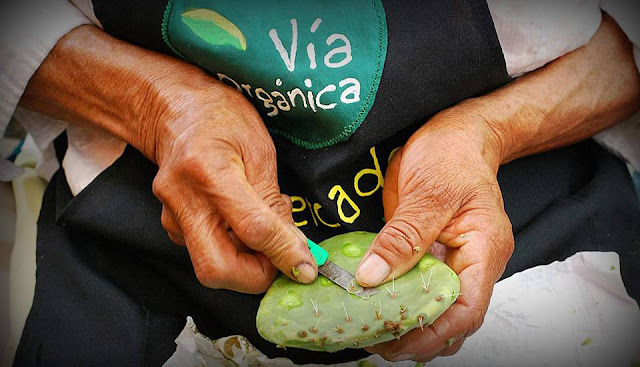 Much of the produce comes from organic growers in Guanajuato. Belmond Casa Sierra Nevada only buys the best ingredients to serve to their guests; I got a taste on Monday when these three chefs dished up a union of wonderful Caribbean and Mexican flavors. 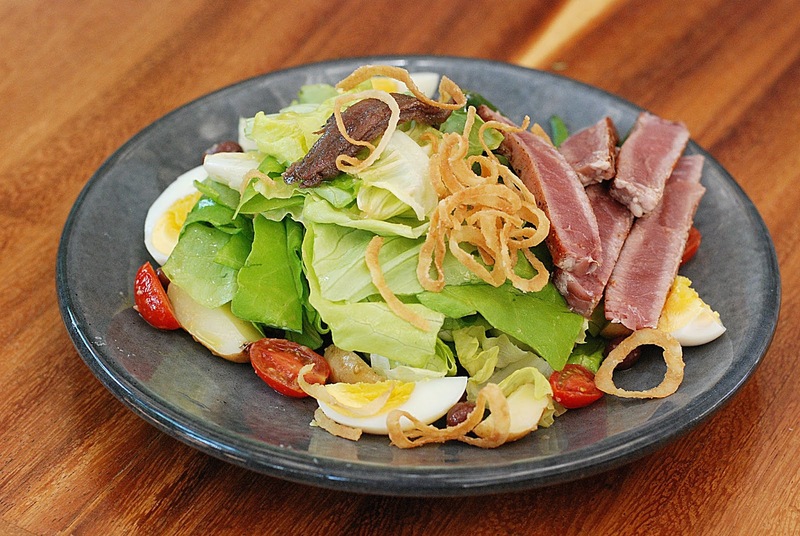 The new menu will be ready in a few weeks; go to savor all the new flavors created by Chef Mariel Beiza. We don't often like chain restaurants but Santo Mar is an exception. Close to SMA, located in the Antea LifeStyle Center in Queretaro, it's known for its seafood. Freshness in seafood is as important as the seasoning and preparation that is given to them and this seafood is always fresh. Look for the raw oyster bar at the back of the restaurant. 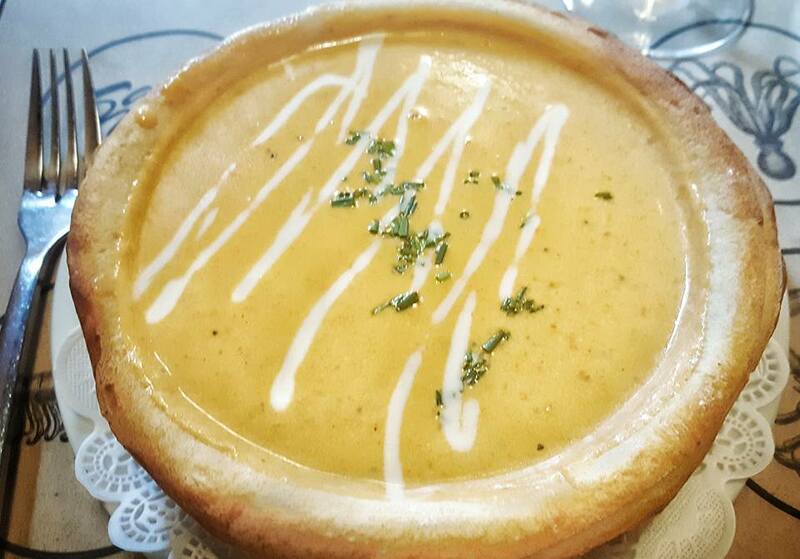 Two lobster soups in breadbowls and Oriental salad with Arrachera or shrimp were the perfect Mother's Day treat. Oh, and can't forget the Casa Madero Chardonnay from Valle de Parras; the perfect pairing for this delicious soup with lots of chunky meat. With restaurants in San Luis Potosí and Guadalajara, this chain measures up because it's seafood is so fresh; much of it sourced direct from Ensenada. I just found out the other night that Chef Alan Carias of Trazo 1810 loves this place; so do I.
Luna de Queso says that the selection of their products reflects the character of their origin. The specific knowledge of production methods, from whom, where and how their product are made, reaffirms their direct connection to each item they offer and its impeccable quality. Take their butter. I'm obsessed with the butter; homemade incorporating orange and honey into the mix. 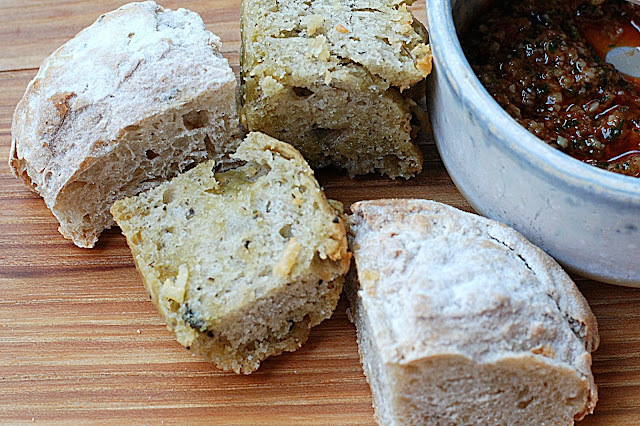 No, they don't sell it but you can sit down and eat a little loaf of their multigrain bread with the butter as the star ingredient before you have your meal; it's on the house. 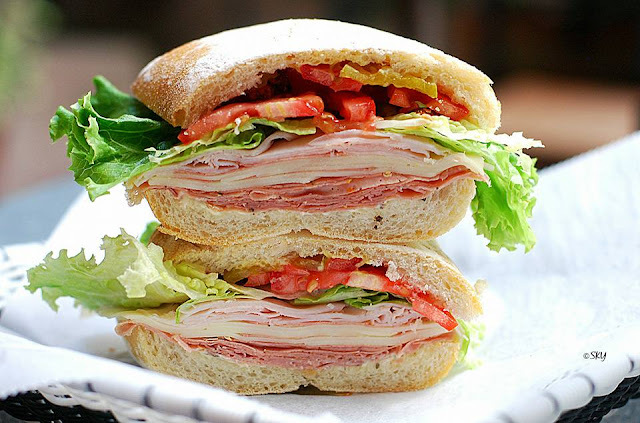 You'll love everything on the menu, especially their selection of great sandwiches, breakfasts and smoothies. And, you'll never have to wonder where their products come from; they've already done that work for you. All you have to do is sit back and enjoy. 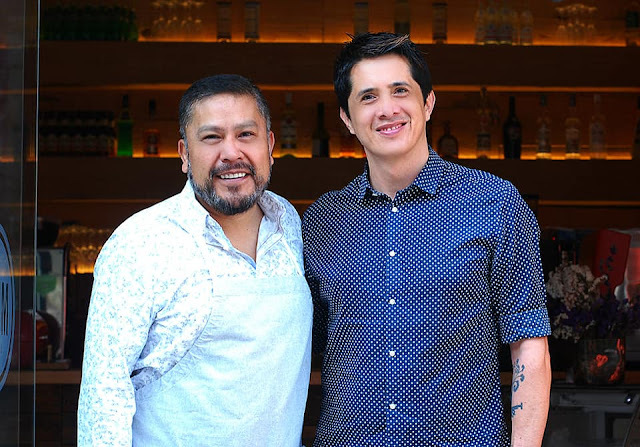 Atrio owners, José María Calvo (Chema) and Jesús Manuel Calvo (Chus), celebrated another successful restaurant opening this past year with Atrio Restaurant and Lounge. 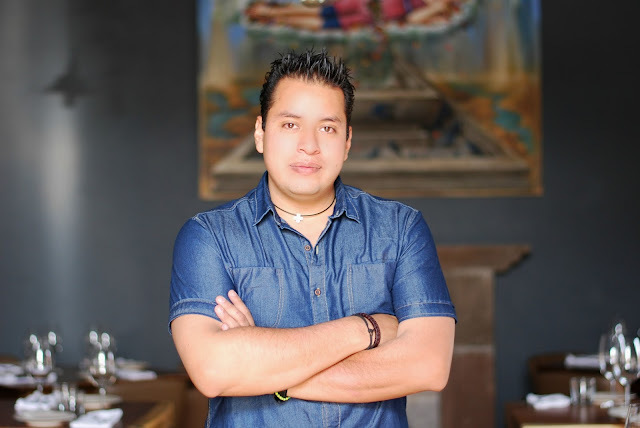 Chef Arturo Sandoval of Atrio fuses cuisines; mainly Mexican, Peruvian, and Spanish. Fourteen dishes into his menu, we’re already smitten. Atrio continues to amaze us with impressive additions to an already outstanding menu. 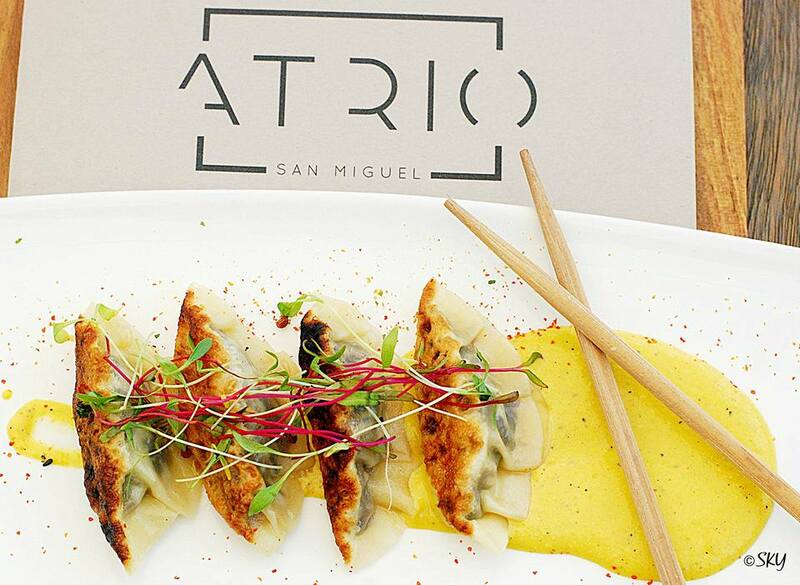 Take these Duck dumplings served with a delicious Ahi amarillo sauce made from Peruvian peppers. This sauce was so good, a real surprise for me because we never had an Ahi pepper the entire month we were in Lima. 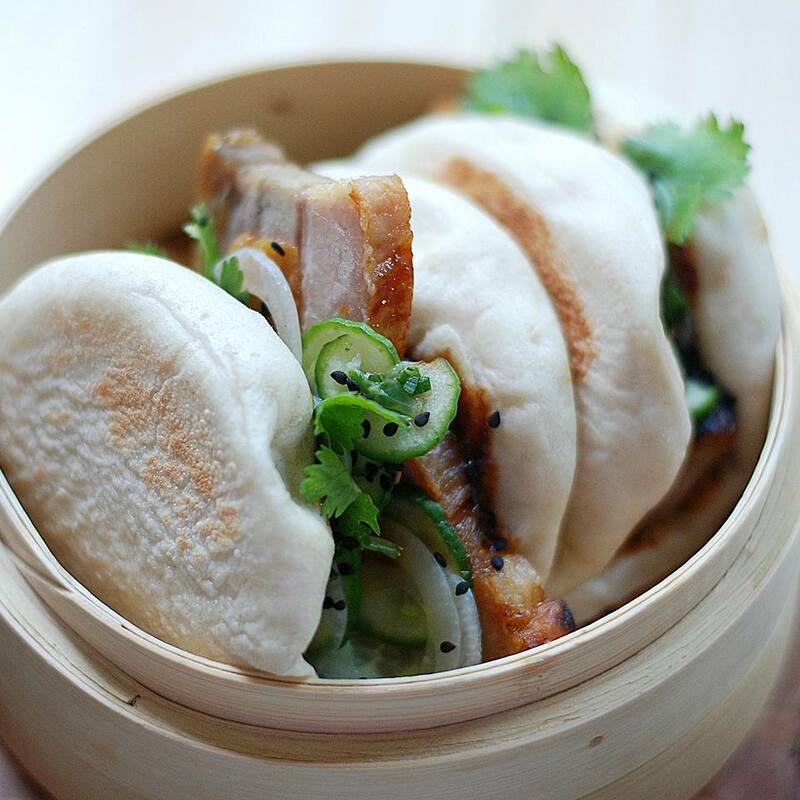 The dumplings will be on the menu soon along with nine other new dishes. 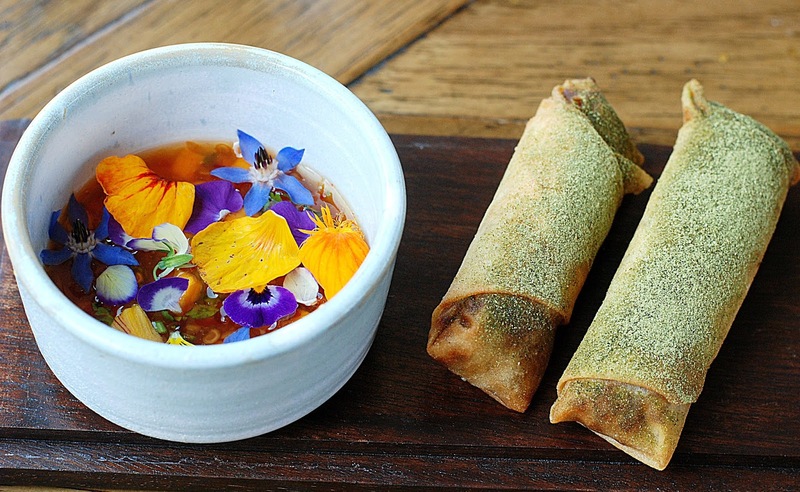 We love a restaurant that changes up their menu often, offering us another excuse to eat out. Atrio sources the best ingredients, buying from Arif Towns Alonso at Simbiosi and other vendors in Mercado Sano, piglets from a farm in Celaya, duck imported from Canada, meat from Sonora; Rancho La Cieneguita, and the fish and shellfish come from Ensenada. The rices, for dishes like the mouth-watering Rib Rice that was our favorite dish in SMA last year, are imported from Calasparra, Spain. Friends send Chef Arturo Sandoval the peppers from Peru; the advantage for a chef who has cooked in some of the world's best kitchens. Attracting locals and tourists alike, the Saturday organic market is the place to be; to shop, to eat and to socialize. I love the fact that I see all of my friends and neighbors there. Take your pick because all of the produce is organic and fresh, along with many other products. One of my very favorite spots in Mercado Sano is Simbiosi. Owner Arif Towns Alonso leads mushroom foraging tours. With the rains, he expects to start the tours and run them June, July and into August but check with him at Simbiosi on the lower level of Mercado Sano. This year, he will be going to four different locations. With organic produce, great food in-house like delicious gluten-free desserts from Denise Rosenfeld's Postres Artesanale, fish from Miguel at La Isla, a delicious Caramel Chocolate Tart from Isabelle Ortega at Pâtissier, Madame la lune, Panaderia La Buena Vida, and other interesting options to choose from, Mercado Sano is one of our favorite spots to hang out on Saturday mornings. And, you even get music to go with the mix. Since Petit Four opened, Chefs Norma Guerrero and Paco Cárdenas have shared their passion for the cakes and pastries with locals and visitors from all over Mexico and abroad. They celebrated their 20 year anniversary earlier this year. Everything at Petit Four is handcrafted from the finest and most fresh ingredients but love and dedication are the secret ingredients. Baked in small quantities several times a day to ensure freshness and flavor, many of the things that are served at Petit Four are made in-house. Butter is a primary ingredient at any bakery and Chef Paco Cárdenas told me that they've used New Zealand butter since they opened; they baked with it at the Marriott Hotel in Mexico City before they opened Petit Four. They've tried other butters but none have performed to the consistency of the New Zealand butter they get delivered in large blocks at the bakery every week. When I arrived in SMA, my first cooking class was with Chef Paco Cardenas; it’s one of the best in SMA. An all day session, you shop for ingredients at Mercado Ignacio Ramirez and wrap up with a sit down feast, complete with wine from Valle de Guadalupe. In between, Chef Paco’s expert knowledge of Mexican food will get your cooking skills ready for some serious entertaining. 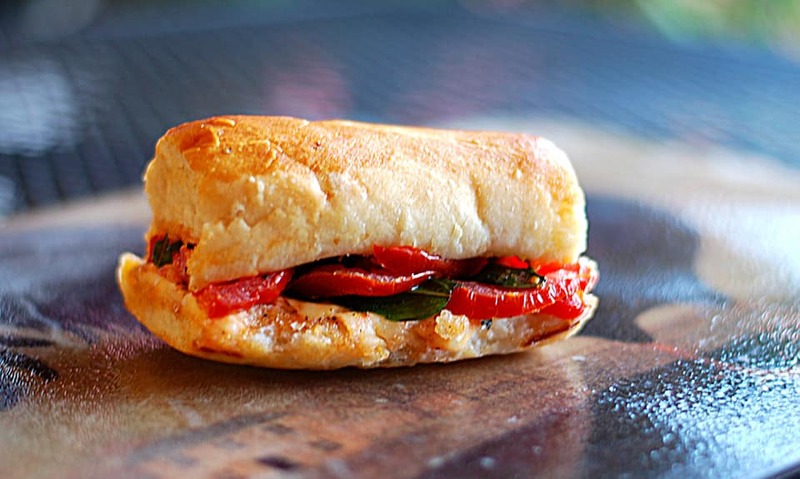 We got this deliciously fresh, Italian sandwich today, stuffed with tomatoes, basil and Mozzarella for $60 pesos. The Florentines? Well that's an indulgence on a whole different level. 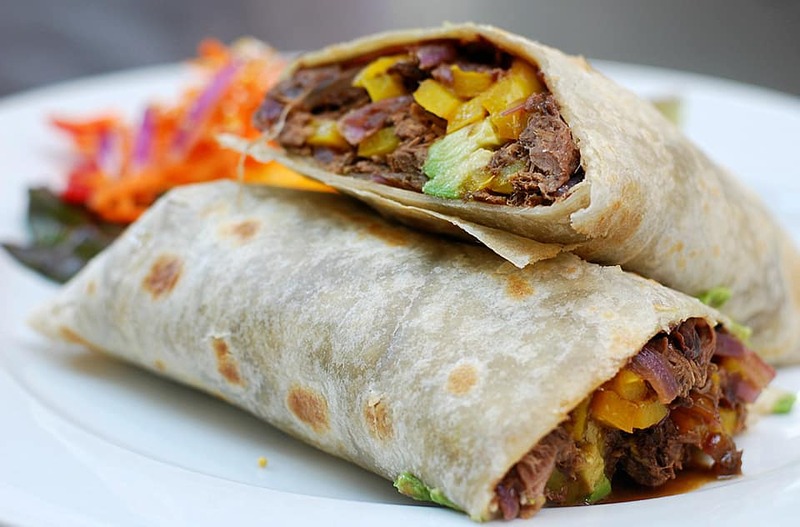 Café Muro delivers the same great taste every time you go. You see multi-generations of hungry eaters packing the house every day, especially on Sunday for breakfast. Owners Gerardo Arteaga and Carlos Muro know how to make their customers feel at home. Their long list of regulars pays tribute to the terrific food and service. They use good ingredients; you can taste them. "Cafe MuRo success can be defined in one word: Consistency! Consistency in the professional and attentive service which has become a tradition from Cafe Muro. Consistency in buying only fresh, quality and local products which allow us to create and prepare tasty, simple and delicious food for our customers. Buying at the local markets with our marchantes, or small stores and shops, or with a long tradition of a family butcher or bakery shop, makes us happy to take care of our customers and treat them like our family. 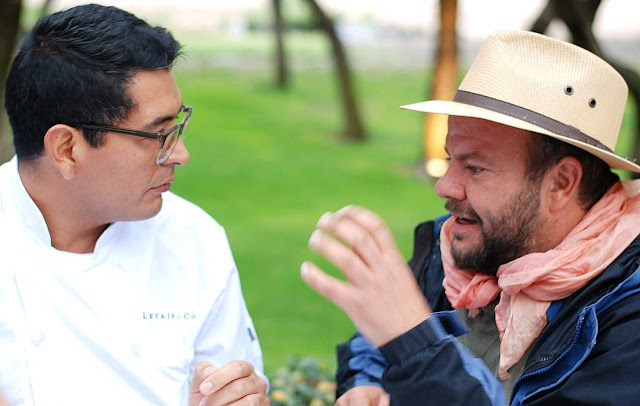 We want them not only to taste our food but to savor a little of our San Miguel food suppliers that try every day to show us that their products are the real soul of San Miguel de Allende's food tradition." Cerrada de San Gabriel 1, El Obraje, 37725 San Miguel de Allende, Gto. 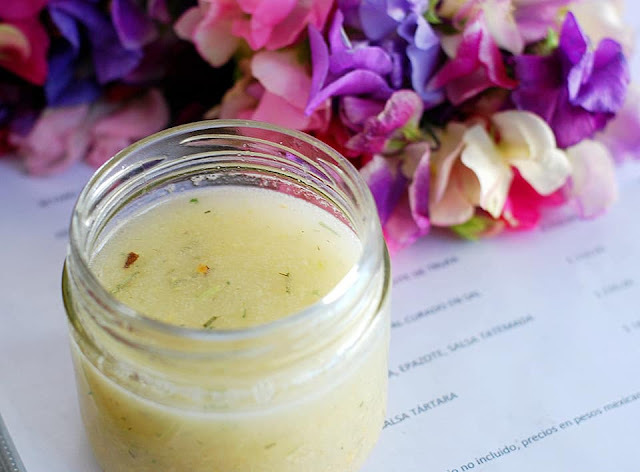 Leave it to a chef, Chef Sofía Antillón, to know how to make simple juice taste so good. Four juices, all made from fruits and herbs, will fill you up. At $50 pesos each, they're a part of Marchanta's new breakfast menu. We drank them as a meal replacement during our detox so why are we back again? The taste; you wouldn't believe the taste and they are made without any sugar or sweetners. We love them all but the Amarillo is our favorite. 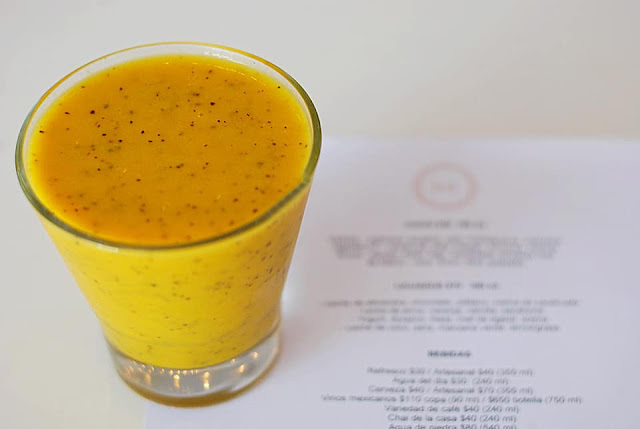 Amarillo:orange, pineapple, mango, passion fruit, and turmeric. That's it! Our new favorite drink. Verde: spinach, ginger, celery, spearmint, nopales and apple. Rojo: Watermelon, strawberries, fig, raspberries and pink peppercorns. Blanco: Coconut, lemon, litchi and guava. 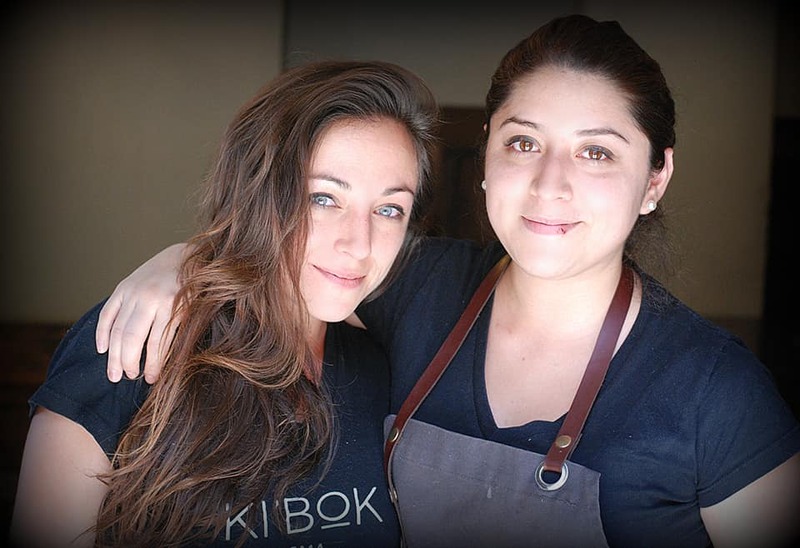 Ki'bok means good aromas in Mayan and good aromas are everywhere in Ki'bok Coffee SMA. We enjoyed a delicious stuffed Avocado for 90 pesos and a fresh-made limonada for 20 pesos. Two other drinks you'll love: the coffee, all organic; Chipas for the cold brew and Veracruz for the hot drinks and Canada de la Virgen's Bone Broth. There are plenty of other interesting things on the menu, like Quinoa Bowls. Much of their produce comes from organic farms in Queretaro. 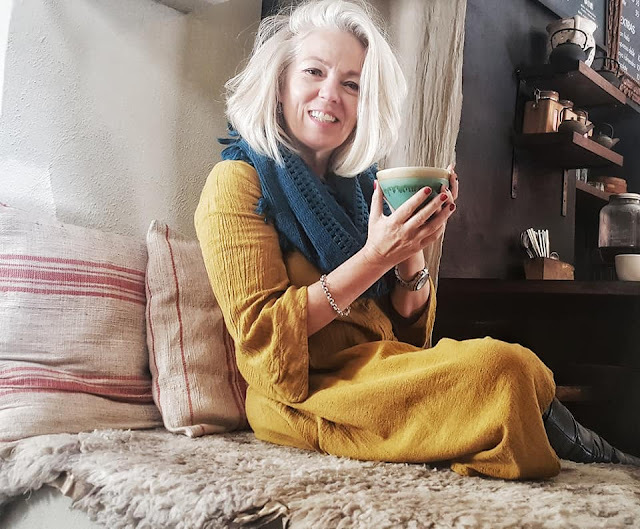 Grab the coziest seat in the house: this little nook, where Canada de la Virgen's Meagan Burns sips a hot cup of healthy bone broth or climb the stairs to the rooftop where Jose Yañez enjoys the view of SMA. Greeting you are a super friendly pair of young sisters from Tulum: Dess Quintero Rocha and Jaimdi Quintero Rocha. Ki'bok's original location is in Tulum. 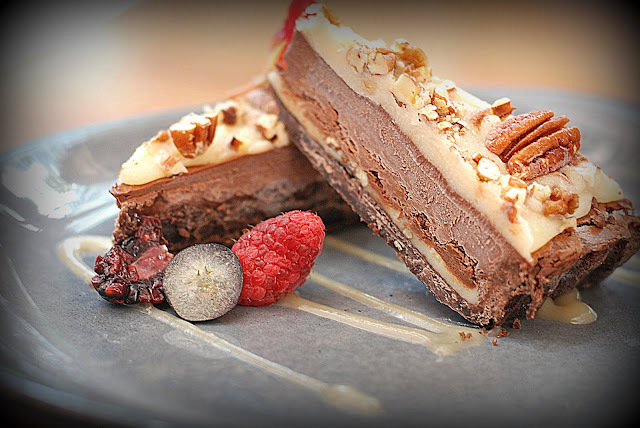 Back in February, 2014, we wrote: " Lavanda Cafe is #51 on Trip Advisor. It should be in the top 10." 543 Trip Advisor reviews later it's right up there; the #1 listing in the coffee restaurants in SMA. Breakfast at Lavanda is as good as it gets. 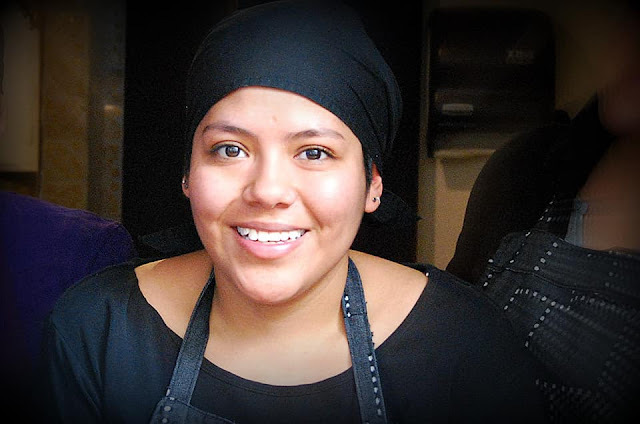 The long lines down the block every single day but Tuesday are a testimony to Chef Karla Becerra Martinez's cooking and her use of good ingredients in every dish she makes. She buys all her produce at Fruiteria Saragosa because she says they have the best quality in town; she's been buying from them for years.They also get select items from vendors in the countryside outside of SMA. Karla loves cheese and she's especially picky when she buys it. She purchases all of her cheese from a small provider in Celaya who buys all of the milk to make it from local farmers. Tortillas, which they also use a lot of, are made in the old traditional process by a husband and wife team who craft all of them by hand. There's no middleman between Karla and most of her producers so quality control is tight. They know what she expects and only deliver the best. 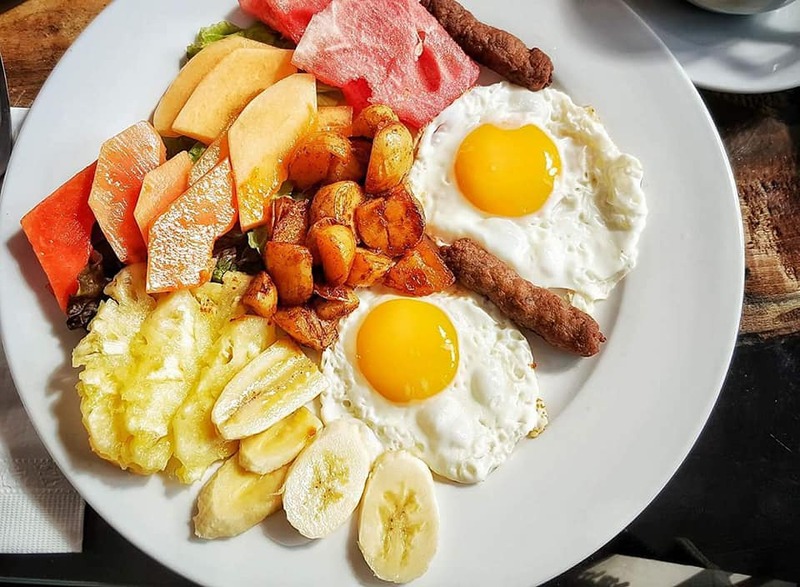 It's one of the many reasons why people call Lavanda Cafe one of the best breakfast, lunch and coffee restaurants in SMA. We think it is too! Monday, Wednesday - Saturday: 8:30 AM - 4:00 PM. Sunday: 8:30 - 2 PM . Closed Tuesday. 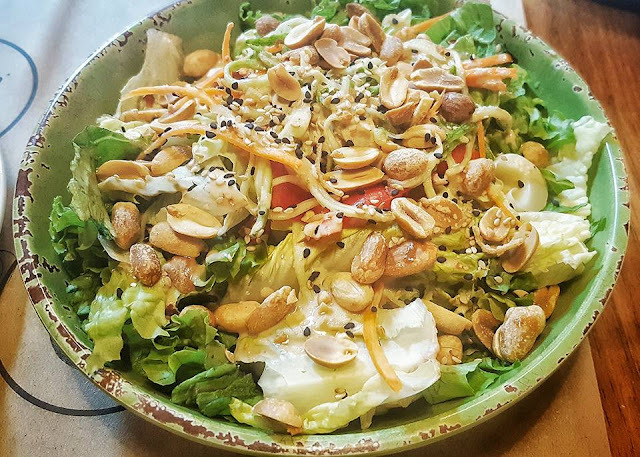 Sally Azar-Serur's nutritious restaurant, Naa Na cocina fresca, recently opened and only uses the freshest ingredients to put on their Toasts and in their Bowls, Salads and Smoothies. 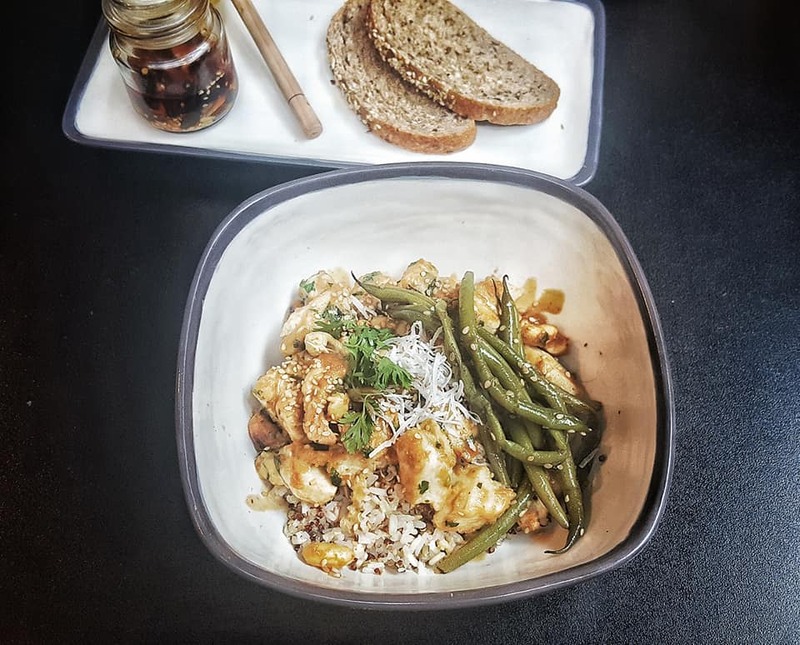 I tried a Chicken stir fry with vegetables and peanut sauce; a healthy fill up, served over a delicious rice blend quinoa and topped with nuts and green beans. We think it's fantastic that Doce 18 finally has a healthy restaurant. In fact, going healthy at least once a week is a great way to keep those kilos in check after successive days of overeating, not to mention the drinking. Some of their produce is local organic but most of it comes from Celaya, Guanajuato, Queretaro and Mexico City. Stop in and chat with Erik Hans, their new chef from Mexico City. He's full of ideas that he wants to implement once the restaurant is up and running; they've only been open for a few days. We like his take on healthy eating. We know you will too. My Italian indulgence: Pizza and Paleta. Tell me where your ingredients come from and I can tell you, without even tasting, if I'm going to love your food. 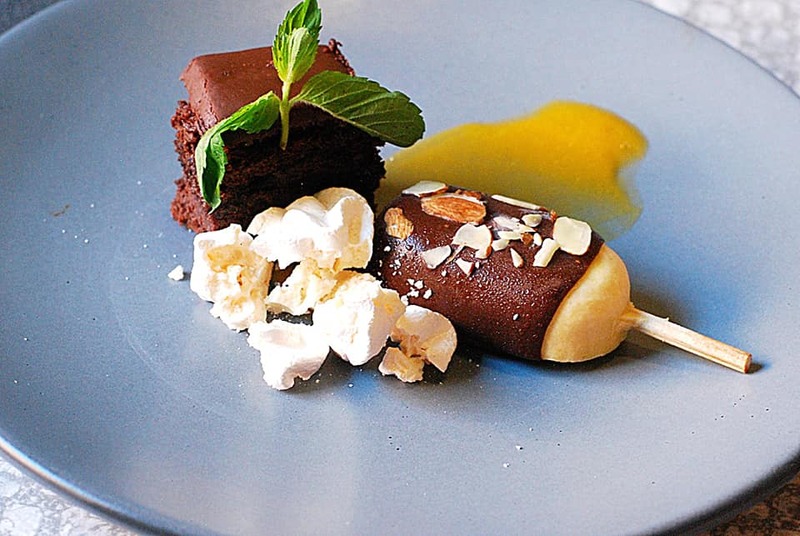 Paleta: In Italy, chocoholics are known as ciocco-dipendenti. I'm definately one after this dessert. Ice Cream - made in-house with an Italian ice-cream machine. On a scale of 1-10, it's a 12! 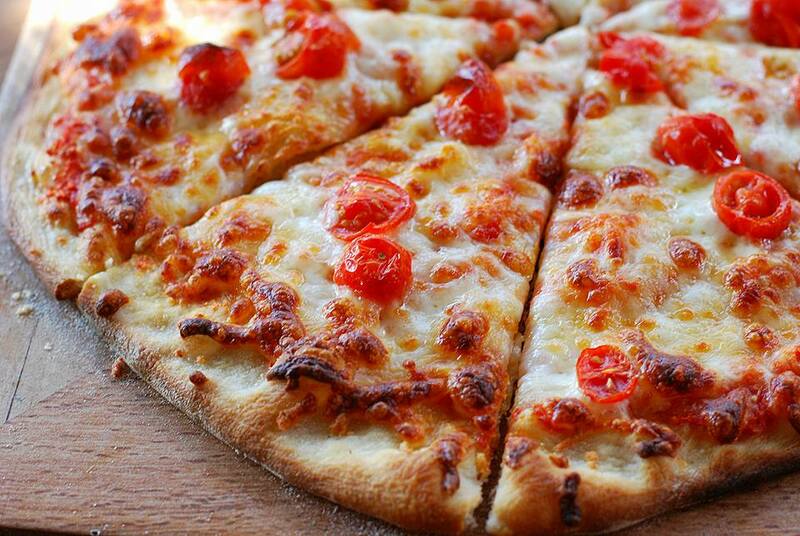 Best Restaurant Pizza in town? Not even a question with all of the great ingredients that go into making it. When Taco Lab and Birdies Burgers came to SMA, I was elated. 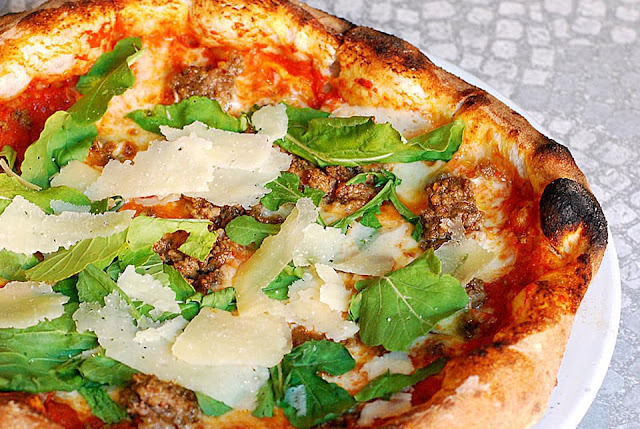 Finally, restaurants that redefine fast food. The king of good ingredients, Chef Donnie Masterton, either grows his own or buys from local producers like Luc Monzies of Bodega Organica at Rancho Luna Escondida, who is helping Chef Masterton with his organic farm, which will ultimately supply all of his restaurants: The Restaurant, El Vergel, Birdies Burgers, Taco Lab, Fatima 7, and Café Casa Blanca. I love the menu here, in particular two items that really define his use of good ingredients: the Marine Girl Salad and this Hardshell taco trio - which I get filled with short rib, carnita and fish. Don't forget to try the Taco of the Week; a special that may ultimately end up on the Tacolicious menu back in the states. We're feeling special because we get to try all the new recipes here in SMA first. 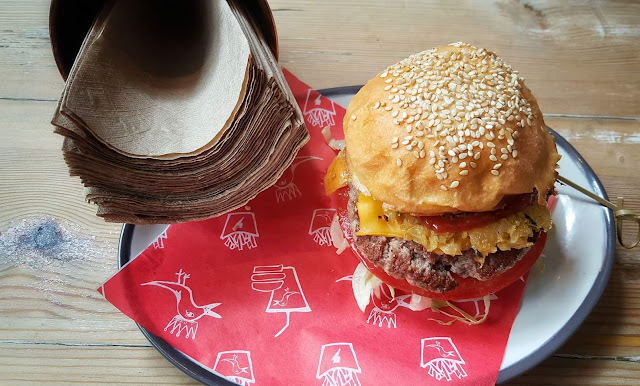 Canada de la Virgin beef and a Panaderia La Buena Vida bun; Burger love just doesn't get any better than this at Birdies. 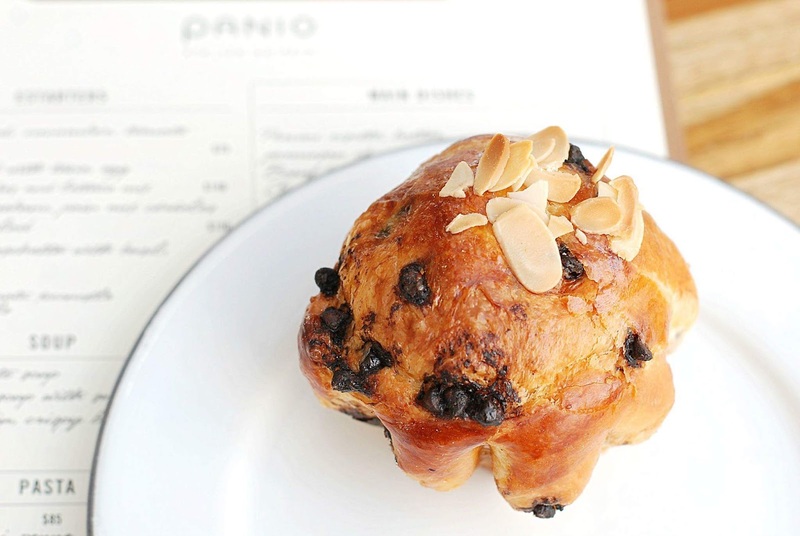 I love the new Panio Atelier du Pain, not just for the high quality bakery goods but also the restaurant, where I frequently enjoy breakfast. 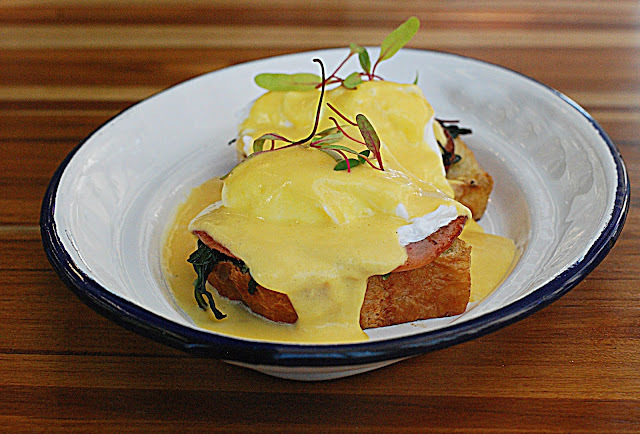 The eggs benedict is a favorite, topped with a perfect, classic French hollandaise sauce with the slight flavor of vinegar. Panio is trying to go 100% organic, with much of their produce being purchased from local, organic producers like Luc Monzies of Bodega Organica at Rancho Luna Escondida. "Que bonito es lo bonito" was a recent Facebook post from Operations Director, Sebastian Acosta Quiroz, who is all about home grown food. I caught a picture of him seated next to Luc at the Outstanding in the Field dinner back in January, engaged in a passionate discussion on the subject of organic food. We like a restaurant that has a respect for the quality of ingredients they serve their customers. And yes, we can taste the difference too. This is a restaurant we truly love. 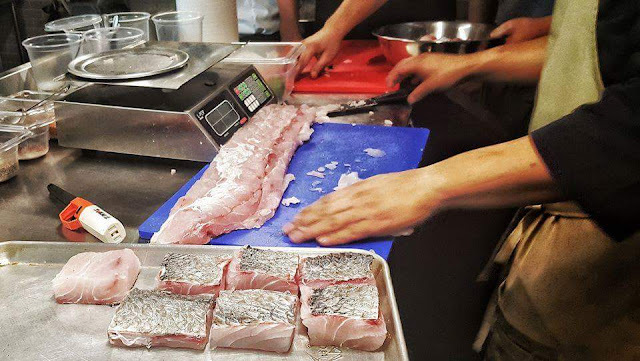 Great food and good ingredients have always been #1 on Chef Alan’s priority list. Chef Alan Carias has a simple method of sourcing his ingredients: "In the restaurant, we have the philosophy of working in the position depending on what the local producers give us, we work with Via Organica, Olio FIno, El Capricho, Luna de Queso and local suppliers of La Placita on Tuesdays, so we can adapt our menu to the fresh and accessible seasonal products." 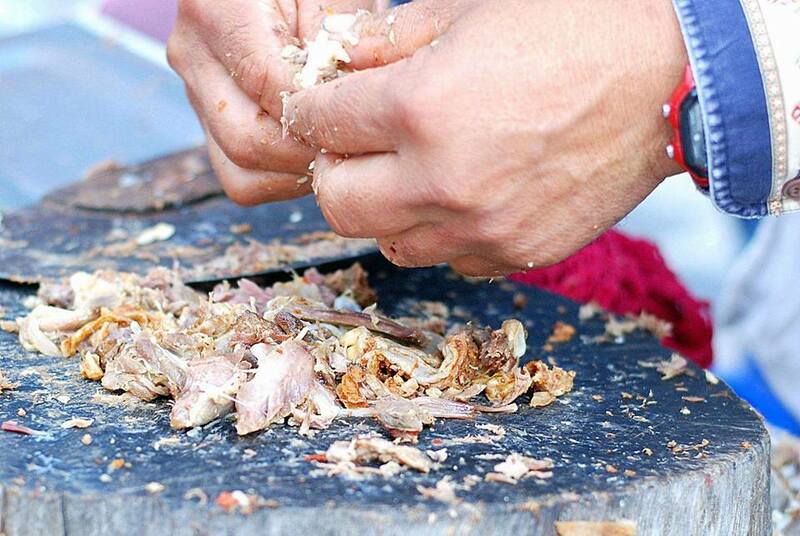 Fish: well most of us know they they fly it in and pick it up in Queretaro so we can enjoy it fresh that night. I recently popped in for something light and true to the Thai flavors that Chef Alan Carias is an expert at creating, we were surprised when the waiter delivered this beautiful presentation, fresh flowers and all. The eggrolls were dusted with celery powder, adding an interesting flavor to the dish. Too pretty to eat? We thought so too... but only for a minute, after which we drifted off, dreaming of our next trip to Thailand. We had a great experience with Chef Magda Elisa Pablos staff in her absence this past week. Ivan is one of the best waiters we know; in fact, everyone on the floor that day could not do enough for the guests. I was impressed with the fabulous service. The food, well that's always remarkable; a given because Chef Magda Elisa Pablos sources ingredients from the same providers used by one of the partners in the restaurant, Chef Donnie Masterton. Either they grow it or buy it from local producers like Luc Monzies of Bodega Organica at Rancho Luna Escondida, who is helping Chef Masterton with the organic farm which will ultimately supply all of his restaurants: The Restaurant, El Vergel, Birdies Burgers, Taco Lab, Fatima 7, and Café Casa Blanca. No matter what you choose off the menu, you know it's going to be delicious, partly because of all the good ingredients that go into preparing it. And when you want to take some of that goodness home with you, stop by the market for a wide selection of gourmet items. El Vergel Bistro and Market is the final restaurant in our 30 day series on good ingredients and like the old saying goes: we saved one of the best for last.